Recognised by HMRC Inland Revenue as Energy Saving! Protect your masonry and facade with secoTHERM®. It is extremely water repellent and reduces penetrating damp by more than 95%. Improve the thermal resistance of your exterior walls and optimize your heating needs. How Does SecoTHERM Masonry Paint Work? Imagine taking a casserole out of the oven with a wet dishcloth. You will burn your hands very quickly… come on, we have all done it! Now try taking the casserole out of the oven with a dry cloth. Suddenly you can handle the cookware for much longer. This is because heat transfers through something wet nearly 3 times faster than something dry. The same happens when you wear wet clothes. Wet clothes make you feel cold and you have to use more energy to try and get warm. This is why we shiver! This is also happening to our homes! Wet bricks convey heat 2.5 times faster than dry bricks, resulting in higher energy bills – 35% or more of our heat is lost through our walls. Our unique transparent masonry paint, SecoTHERM guarantees to slow down this process, lowers thermal conductivity for at least in excess of 20 years! On the image to the right, the white spots and lighter yellow areas show how much heat is escaping from the property. This is wasted energy which costs you MONEY! Now look on the the left hand side of building, this has been treated with SecoTHERM transparent masonry paint. The darker orange means less heat is escaping through the wall. Unlike other basic masonry paints, a SecoTHERM treatment is proven in tests to slow down this process, saving property owners energy and money. SecoTHERM also enhances the look and appearance of your home as it creates a self-cleaning surface which protects against dirt, pollution, moss and algal growth. The picture below shows SecoTHERM during it’s curing process. SecoTHERM dries completely clear, penetrates up to 17mm into the surface and becomes part of the substrate. This creates an ultra hydrophobic (Waterproof) exterior wall that is guaranteed for 20 years (life expectancy many more) and which will allow your damp walls to dry out naturally. SecoTHERM is developed to the highest standards and is THE ULTIMATE WEATHER PROTECTION for bare masonry walls, stone & bricks. Water and UV degradation are the two key elements in the damage of masonry surfaces. 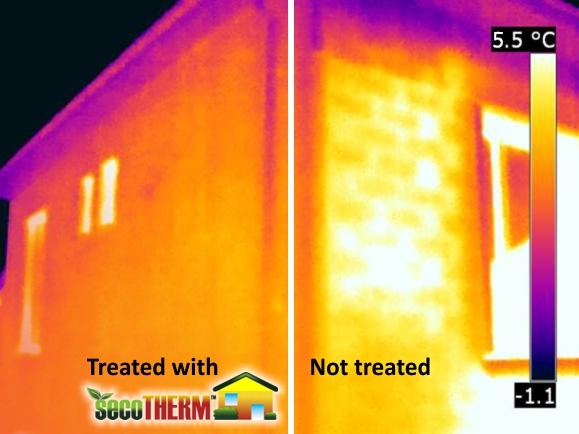 SecoTHERM however is completely unaffected by UV rays and the unique formula creates a barrier against water while the exterior wall surface remains permeable to water vapour. Preventing water ingress through exterior walls and bricks can reduce energy consumption by up to 30%. Porous building materials such as natural stone, bricks, solid brick etc normally have good insulating properties because they have air-filled cavities which offer low thermal conductivity. BUT ONLY WHEN THEY ARE DRY! Water absorption can be minimised dramatically by having SecoTHERM installed on your property. 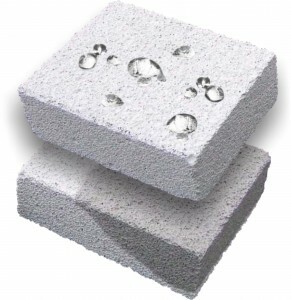 On a porous brick the water absorption will be reduced by more than 95%! SecoTHERM has been tested to EN ISO 15148:2002, demonstrating it’s hygrothermal* performance on concrete, mortar, brick and sandstone. The product is proven to save 30% or more of heat escaping through your walls depending on the porosity of the masonry. 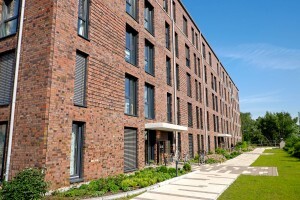 SecoTHERM has been tested by the Danish Technological Institute for it’s thermal properties and has been PROVEN in test to reduce energy consumption. Remember the less heat that escapes through your walls, the more energy efficient your property becomes. Damp walls are thermal bridges – If moisture is allowed to collect in the pores of your walls, more heat is transferred than would be possible if the cavities were filled with air. The thermal conductivity of the wall decreases enormously with dampness. Tests have shown that a damp content of just 5% in a plain brick wall for example, can lower insulation performance by up to 50%. This is especially pertinent where cavity wall insulation has been installed. When cavity wall insulation gets wet it loses it’s thermal value. Many home owners do not realise this fact. Cavities in houses were not meant to be filled. They were there to keep the cold wall on the outside of the property. Now this has been filled and the cavity wall insulation has got wet, it has created a thermal bridge moving the cold wall to the inside of the home. This creates condensation that turns to mould and leads to cold homes. 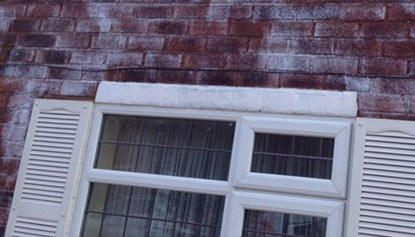 There are thousands of cases up and down the UK where home owners are now suffering really cold, damp and mouldy house conditions due to wet cavity wall insulation. A SecoTHERM installation will stop walls getting damp and will allow walls to dry out naturally, in-turn keeping the performance values of the cavity wall insulation. Improves the thermal efficiency of the masonry by keeping it dry (potential heat loss of up to 30%). Offers a self cleaning surface. Slows down the aging of brickwork. Less susceptible to the growth of microorganisms and algal bloom.